Creamy Madagascar vanilla notes dance with tingling Malabar Coast spices. A lively ginger finish is accentuated by candy cardamom. Combines black tea, ginger, cinnamon, cardamom, black and white pepper, clove nutmeg, and calendula petals. Luxury Ingredients: Black tea, Ginger, Cinnamon, Cardamom, Black & White pepper, Clove, Calendula petals, Nutmeg, and Natural flavors. 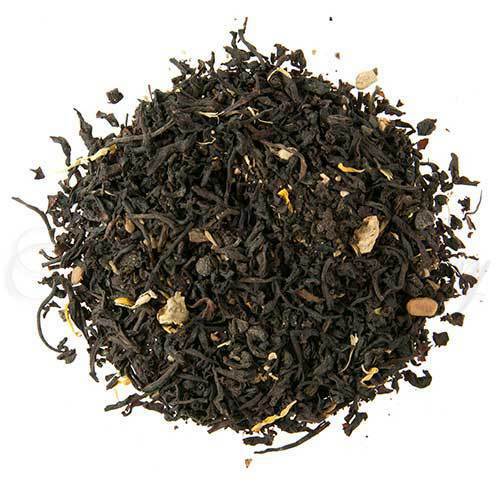 Indian chai is typically made using a rich black tea, usually an Assam, and brewing it in heavy milk with cardamom, cinnamon, ginger, cloves, and pepper. The drink produces a warm soothing effect and engenders a wonderfully calming effect on the body. We‟ve taken the soothing aspect of this blend one step further and added a dash of vanilla. This addition of vanilla adds a hint of creaminess to this tea – a fantastic addition. Brew this tea piping hot and add some sugar to help open up the exotic flavor of the spicy blend that makes up this tea. Just try and stop yourself after one cup!